Expand your training potential and income by learning how to successfully train in the aquatic environment. This course helps you gain understanding of the aquatic environment and the properties of the water. The water’s viscosity provides resistance that surrounds you and provides “work” for every movement in every direction. The water’s buoyancy reduces body mass, reduces impact to weight bearing joints, and reduces spinal decompression in deep water. The water’s hydrostatic pressure affects many of the body’s physiological functions. 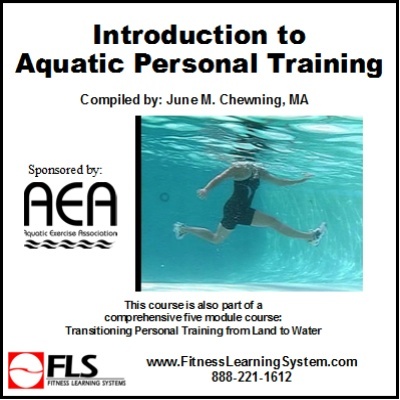 If you want to be successful as an aquatic personal trainer, learn about the special benefits and qualities the aquatic environment has to offer and incorporate that knowledge into your personal training sessions. This course is part one of a three course certificate program. Part two is Aquatic Personal Training Programming, part three is Applied Anatomy: Land and Water.